If washing your face with charcoal does NOT turn you off, this is one of the most effective ways to exfoliate and tone skin - especially in the t-zone area. The bad news is that even if using charcoal (natural charcoal has the ability to draw out impurities in skin by the way), doesn't bother you in theory, this is a black foamy product that looks a bit like dirt coming out of the tube. 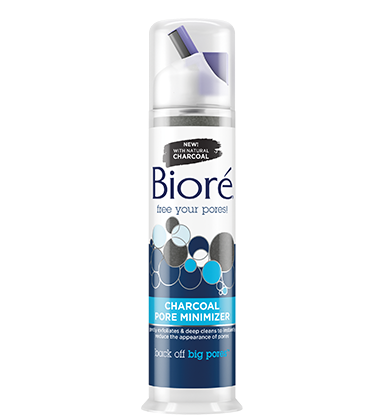 But boy, does Biore Charcoal Pore Minimizer do the trick! The product comes in a plastic tube with a pump (Note: you must press the pump several times to activate the product to come out the very first time you use it). I dampened my face, used one pumps' worth of the pore minimizer and the product turned from the black shade to a white foamy product once I mixed it with water. After rinsing off, I was very impressed with how much "tighter" and smooth the area around my nose and cheeks looked - and felt. The effect did last through applying my makeup for the day ,etc., so this also makes an ideal product to start your night time pre-party makeup prep. While the effect did go away, each of the 2-3 times a week I used it, I had a same result. My skin was smooth and had the most beautiful sheen and glow. If you have oily or combination skin, moisturizing afterwards will depend on what you might need that day, but if you have slightly drier skin, I would recommend adding a hydrating serum or moisturizer after the treatment, as it does have a bit of a drying effect as it tightens the skin. I didn't experience any irritation or breakouts, even with the exfoliating effect.